» Home » Featured, News And Events, Slideshow » NEW PUB: MCDOWELL ET AL. : ADAPTATION ACTION AND RESEARCH IN GLACIATED MOUNTAIN SYSTEMS: ARE THEY ENOUGH TO MEET THE CHALLENGE OF CLIMATE CHANGE? EDGES member Graham McDowell co-authored an article titled, “Adaptation action and research in glaciated mountain systems: Are they enough to meet the challenge of climate change?” in Global Environmental Change. 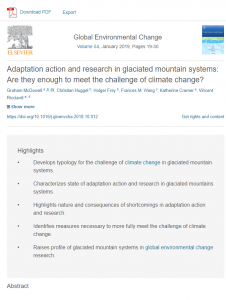 Abstract: The challenge of climate change in glaciated mountain systems is significant and cannot be met without adaptation actions and research that addresses the interwoven scientific, human, and socio-ecological dimensions of climate change. However, our understanding of the effectiveness of existing efforts in meeting this challenge is lacking, a shortcoming compounded by a lack of consistent and comparable information about adaptation action and research in glaciated mountain systems. This study develops a typology of the challenge of climate change in glaciated mountain systems and uses formal systematic review methods to critically evaluate existing adaptation actions and research in light of this framework. Our results––based on an evaluation of 170 English-language peer-reviewed and grey literature documents––indicate that socially-relevant climate-related changes are already manifesting in glaciated mountain systems, with the most commonly documented stimuli for adaptation being hydrological changes related to the degradation of the high mountain cryosphere. Some degree of adaptation action has occurred in 78% of countries with glaciated mountain ranges, but most adaptations are reactions to experienced climatic stimuli and carried out without guidance from a formal adaptation plan. The study also identified the emergence of explicitly mountain-focused adaptation research, yet studies framed in this way are still relatively scarce and have only been carried out in about half of the countries with glaciated mountain ranges. Although we document several laudable adaptation action and research efforts, few initiatives are adequately addressing the difficulties outlined in our evaluation framework for the challenge of climate change. The study discusses the consequences of observed shortcomings and identifies recommendations for more fully meeting the challenge of climate change in glaciated mountain systems. McDowell, G., Huggel, C., Frey, H., Wang, F.M., Cramer, K. and V. Ricciardi. (2019). Adaptation action and research in glaciated mountain systems: Are they enough to meet the challenge of climate change? Global Environmental Change 54: 19-30.